If you have localized content for your Help Center, you can manage translations for articles by flagging them as outdated, setting the source language, or deleting translations as needed. Multi-language support is available on Guide Professional with Support Professional or Enterprise. You must be a Guide manager to manage Help Center translations. You can flag an article translation as outdated, meaning it needs to be updated. Navigate to the translated article you want to set, then click Edit article in the top menu bar. Select the language of the translation from the drop-down, if you are not already viewing it. 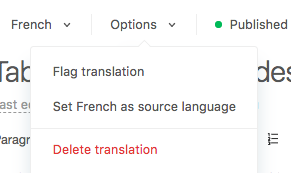 Click Options, then select Flag translation. You cannot set the source language as outdated. The translation is flagged as outdated so that you know it needs to be updated. When you have article translations, you need to set one article as the source language. The article you set as the source cannot be removed. Select the language of the translation from the drop-down. Click Translation options, then select Set as source language. You can delete a translated version of an article if necessary. You cannot recover a deleted translation. Navigate to the translated article you want to delete, then click Edit article in the top menu bar. Click Translation options, then select Delete article. If you are trying to delete an article that is currently the source language for the item, you must first set another article as the source language. Be able to show the article in the source language when a translation is not available or ready. Easily select internal articles to link to, for example by selecting articles from a dropdown menu. Now I need to find the link by searching for the article on the Help page and then copy pasting that link. Was browsing about the "Flag Translation" in the translation options and found this article. We used to be able to flag all translations as outdated at one time. Is this feature no longer available? It would be useful as we sometimes work with 20+ languages and it would be tedious to go into each one to flag. In Arrange content - Edit category, go down to Language and press the "Settings-wheel"